If buying sandwiches from a pharmacy seemed alien to me, I wonder what I would have thought about department stores selling them. I learned what Marks and Sparks was on the same tram journey back from Meadowhall that I learned what aubergine was (it was being used to describe a pair of unpurchased trousers, rejected for their colour). I had already learned that pants meant undies, and trousers indeed pants. Piece of cake, this English. Nowadays, I solely consider M&S Simply Food, indeed. Thanks to their taunting adverts and fancy scran, I tend to think of their lunches as a tiny treat yo’self indulgence. 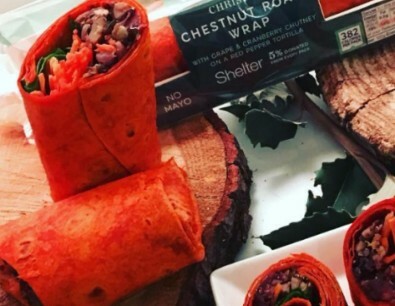 Their first vegan wobs offering is a wrap – red pepper tortilla filled with carrots, spinach and chestnut/mixed grains, with grape & cranberry chutney to glue it all together. Ewan wasn’t overly impressed with the textured tortilla, and found the contents unevenly distributed with many too-carroty bites, overall rating it disappointing. That wasn’t a problem with my wrap, but it was pretty small and not very filling. I did like the use of chestnuts – very xmassy – but I found it a bit too virtuous and not quite within the spirit of the xmas sanger. Addendum: two other things I learned, later, during my first xmas in the UK was that Christmas singles were a thing – it was the Spice Girls. And there was a time when Merry Xmas Everybody and I Wish it Could be Christmas Everyday were songs I had never heard before.